TCC is unique in it's commitment to communicating the history and ecology of the park through ecological and artistic endeavors. Our signature EcoArt installations build on a community model that emphasizes the natural synergy between the arts, the environment, and education. Led by our EcoArt committee, artistic projects are identified, an appropriate EcoArtist is commissioned. In collaboration with the artist, activities and curriculum are developed for local school children and the community at large. Tell us about your art. Include links to your work. Learn more about the artists that volunteer their time and talents to our park HERE. The Peace Totem by local artists Frank Ottochian and Anthony Santella incorporates native wood and recycled cans to convey messages of peace. This project has been made possible in part by a grant administered by the Bergen County Department of Parks, Division of Historic and Cultural Affairs from funds granted by the New Jersey State Council on the Arts and by a grant through Investors Bank Foundation (read the press release HERE). This project has been made possible in part by a grant administered by the Bergen County Department of Parks, Division of Historic and Cultural Affairs from funds granted by the New Jersey State Council on the Arts and by the Jack Flamholz Water Sustainability Project. The Harmony Garden was created by Erika and Elizabeth Herman, Teaneck residents and students of the Loomis Chaffee School in Windsor, CT. This project was made possible by a Norton Fellowship Grant from Loomis Chaffee. This project used recycled and natural materials to make musical instruments, combining a love of music and a passion for sustainable living. As you travel through the garden, scan other QR codes to learn about each instrument, how it was made, what materials were used and how to make the best sound. You can learn more about each instrument in the Harmony Garden HERE. The Turtle Peace Labyrinth is defined by a beautiful structural piece of artwork designed by David Robinson of Natural Edge LLC. The Gates project was made possible in part by a grant administered by the Bergen County Division of Cultural & Historic Affairs from funds granted by the New Jersey State Council on the Arts in 2017. The project defines the area of the Labyrinth and creates an inviting yet secluded area for meditation, creativity, and peaceful reflection in nature. Additionally, the new fencing blends with the natural surroundings allowing visitors to see past the fence into the rest of the park. The Tower provides a place to rest in the Labyrinth, when you visit make sure to look up to see the sky through the ingenious skylight. An homage to both a favorite musician (Bob Marley), and the Scottish concrete poet, sculptor, gardener and conceptual artist Ian Hamilton Finlay and NY graffiti artist John Fekner, Rick offers this recycled, sandblasted hunk of highway debris as a trailside caption and commentary on the piles of concrete historically dumped in the Conservancy. Rick has done extensive research into the environmental and cultural history of the Hackensack River Valley and its watershed, including Teaneck Creek. To reveal this history to the public – and to provoke questions concerning past and future land use decisions - he has created a series of thirty-one collaged, non-linear, multi-layered narrative signworks. These artworks have been deployed along the Hackensack River and will be part of the final phase of construction of the Fycke Lane Entrance Project. To see more of Rick's art visit: www.richardkirkmills.com. Migration Mileposts link communities from Canada to South America through our shared wildlife: migrating birds that use the Atlantic flyway. Artist Lynne Hull, "I believe that the creativity of artists can be applied to real world problems and can have an effect on urgent social and environmental issues. My sculpture and installations provide shelter, food, water or space for wildlife, as eco-atonement for their loss of habitat to human encroachment. Research and consultation are essential to project success. I prefer direct collaboration with wildlife specialists, environmental interpreters, landscape architects, and local people for design integration." At Teaneck Creek Park, “NJ Rubblestone”, (a.k.a.hunks of discarded highway concrete) has been recycled through sandblasted stencils which tell of the travels of eight bird species observed here. “As trees are our oldest living earth-companions they have tended to pick up a lot of history and associated stories”, Rick points out. The most ambitious EcoArt project undertaken by TCC so far is the transformation of the Five Pipes. These five-foot diameter concrete “monoliths” are thought to be drainage pipes left over from construction of the NJ Turnpike. In 2008 TCC commissioned muralist Eduardo Alexander Rabel to lead school children and volunteers in creating a pictorial history and future vision of Teaneck Creek Park. The five pipes were designated to represent historic eras: prehistory, European colonization during the 18th Century, industrialization of the 19th Century, the 20th Century, and the Future. The inside of the pipes depicted the human aspects of each era and the outside represented the environmental features or degradation associated with each time period. Working though the entire school year 2008-09 Eduardo completed this terrific project last fall, and the installation was dedicated by Bergen County Executive Dennis McNearny. The Future Pipe illustrates two pathways – a sustainable environment or continuing degradation – we hope the children’s sustainable vision comes to be! 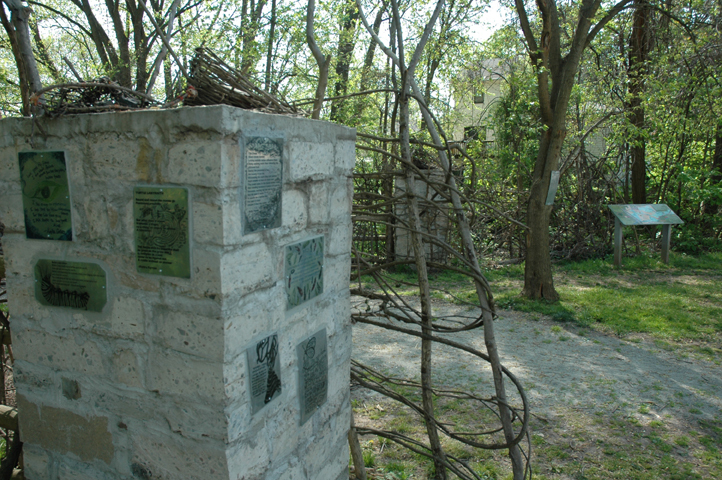 A metaphoric Fycke (a “V” shaped Lenape fish or animal trap) fence constructed with recycled concrete debris – historically dumped on site, wood, vines, twigs and planted with living vines, ornamented with student art in the form of ceramics, handmade paper and poetry. Eight 2 X 4 foot sign stanchions carrying collaged narrative artwork revealing the land’s environmental and cultural history that ask viewers to question the lens through which they see our environment. These eight “canvases” will be available for rotating displays of future student and visiting artist projects. An ornamental crosswalk connecting the Conservancy with the community and the middle school directly across Fycke Lane. In the fall of 2010 Sculptor Anthony Santella carved local animals into the trunks of fallen trees at Teaneck Creek Conservancy. Anthony offered demonstrations of carving with traditional hand tools as he worked on several large sculptures that will remain on permanent display at the Conservancy. Several large locust trees came down in a storm, which uprooted hundreds of trees throughout Teaneck. Anthony was inspired by the sight of the trunks lying by the path and envisioned them carved into partially stylized animal forms as a celebration of the diverse, often unseen and unappreciated, wildlife that exists in the area. A Red-tailed Hawk and a Turtle were carved into sections of whole tree trunks, using traditional hand tools, hand saws, chisels, gouges and mallet. The carvings are left untreated, and allowed to naturally weather, ultimately decay, and returning to the soil over the course of decades. Internationally-exhibited photographer Rachel Banai and her students in the Puffin Camera Club installation “Windows on the Park – Public/Private Space”. The show, which hangs each spring for one month, features the work of eighteen photographers who have cataloged the park’s natural beauty and recorded its metamorphosis from dumpsite to restored oasis. 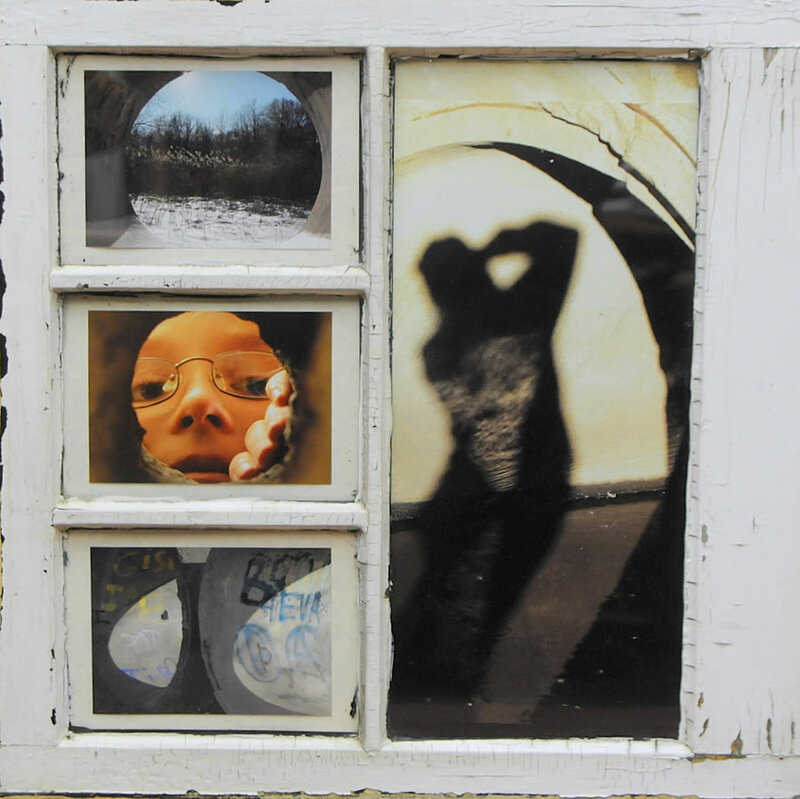 In an unusual and provocative move, the images in the show are framed in salvaged wooden window sashes and hung outdoors in the meadow area of the park. “The show is an exploration of public and private space,” says curator Rachel Banai, “The windows have been removed from the walls of a home, - walls that claim to protect an individual’s private space – and transplanted into the imaginary gallery walls of an open-air meadow.” The viewing public is challenged to decide if what they see is an image or a reflection. Are they “looking at” or “looking through”? The Atlantic Flyway Project, by artist Valentina DuBasky, is a large-scale geoglyph/earthwork that was created on-site at the Teaneck Creek Conservancy in October, 2004. The earthwork depicts images of a heron that may be seen from the air, as well as from footpaths within the park. Suggesting a correspondence between the birds that fly through the New York and New Jersey area each year along the Atlantic Flyway and the visitors to the Teaneck Creek Conservancy, the earthwork was constructed entirely from natural materials found within the Conservancy. In “Love Motel” Bio-artist Brandon Ballengee created a temporary outdoor installation using ultra-violet (black) light to study and photograph arthropods (spiders, moths, beetles, etc.) and other nocturnal creatures. Students and their families and the public were invited to participate in this research. Attracted to the light, these creatures mated and fed on the sculpture. Moths released chemical pheromones to attract mates and consequently "paint" the piece, while spiders spun webs adding their own contribution to the work. This ongoing series of sculptures has previously been created during 2001 through the present in Asia, Central America, Europe, and North America. In Imaging the Species of Teaneck Creek students and the public went Fishing! Using a trawling technique with fine mesh plankton and seining nets, participants collected, examined, discussed, identified, and drew various species of microscopic and macro organisms using the scientific method. This activity culminated in a discussion on the aquatic food chain of the Teaneck Creek followed by students performing stages of the web. Exploring the boundaries between art, science and technology, Brandon Ballengée creates multidisciplinary works out of information generated from ecological field-trips and laboratory research. Since 1996, Ballengée has collaborated with numerous scientists to conduct primary biological research and advanced imaging procedures. He was the first American Artist to be invited as an artist in residence at the Natural History Museum in London. “I play a game with my five year old son. We use sticks to mark a one foot square on the ground then we count the things going on in that square. We count bugs and plants and evidence of otherbugs, plants and animals that have passed through. The Teaneck Creek Park as a small nature preserve, makes it an ideal site for witnessing human interaction with 'nature' and for noticing the network of connections between things natural and un-natural, native and invasive, pastand present. It is to the planet what the one square foot is to our little homestead. At every bend and obstruction in the Creek, a collection forms, consisting of plant and tree detritus and all manner of human litter. I see the Creek and all of the tributaries as symbolic of the passage of time. The sculptures I’ve created for the park are made from these collections of creek refuse. I want to make art that is part of nature”, says Roy Staab of the etheral sculpture that he created from reeds in the Teaneck Creek Conservancy. Staab sought out the perfect location within the wetland environment of the conservancy for the approximately 60 foot high, 100 foot long and 50 foot wide installation, finding it at the convergence of two trails where a cottonwood tree stands. Assisted by four students and artists, he bundled the reeds that he gathered from the surrounding area with nylon string. He then created an arrow by suspending five lines from a fork in the cottonwood, which fan down 16 feet before doubling into ten lines that swoop downward across the space and then curve back up to attach to other trees at varying heights. The curve forms a swaying ceiling meant to give a sense of protection to anyone standing below. Since 1979, the Milwaukee-based artist has created large scale ephemeral installations in nature using found materials such as reeds, bamboo, snow, stones and lines drawn in the earth. His creations are simple geometries born of place, the materials used and the local cultures of the places he visits around the world. The delicate nature of the materials themselves, and the relentless tug of gravity which inevitably destroys them serve as reminders of the fragile and transitory nature of life. Like three-dimensional line drawings made of and in the landscape, Roy Staab's sculptures diagram the ties and relationships which bring us together. In 2006, Sarah Davol, a Teaneck, NJ resident, composer, and musician, who has written original music for special events at the Conservancy, conceived the idea of telling the stories of long time Meadowlands residents in the Teaneck Creek neighborhood. Davol is a member of the Teaneck Creek Conservancy’s EcoArt Committee. Davol and artist Richard Kirk Mills facilitated the participation of neighborhood residents in the taking of their portraits and telling of their families’ histories for Life in the Meadows. Rachel Banai and her students made the portraits of local Meadowlands residents at the Conservancy. Other subjects and family artifacts were photographed by Ms. Banai, Richard Mills, and Tim Blunk in their homes. Sound recordings were made of the subjects’ stories and family folklore by Mills and Davol. In the very successful exhibition, the subjects’ portraits were grouped with family artifacts, photos, and stories in “shrines” that illuminate and celebrate each family’s history. Distinguished longtime Meadowlands resident John R. Quinn, artist and author of Fields of Sun and Grass: An Artist’s Journal of the New Jersey Meadowlands. lead a walk and talk at the Conservancy.